Greetings Humanists! You’ve made it to September, well done! That is to say, you’re probably about well done by now. Stick a fork in me. Is it October, yet? Before I get too deep in thought here. I hope you had some time to enjoy the partial or total solar eclipse of August 21, 2017. 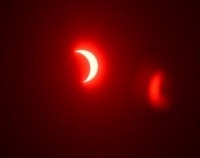 It was a spectacular event and many of the leaders of The Humanist Society of Greater Phoenix are planning ahead to April 2024, when it the next eclipse will pass through Texas. 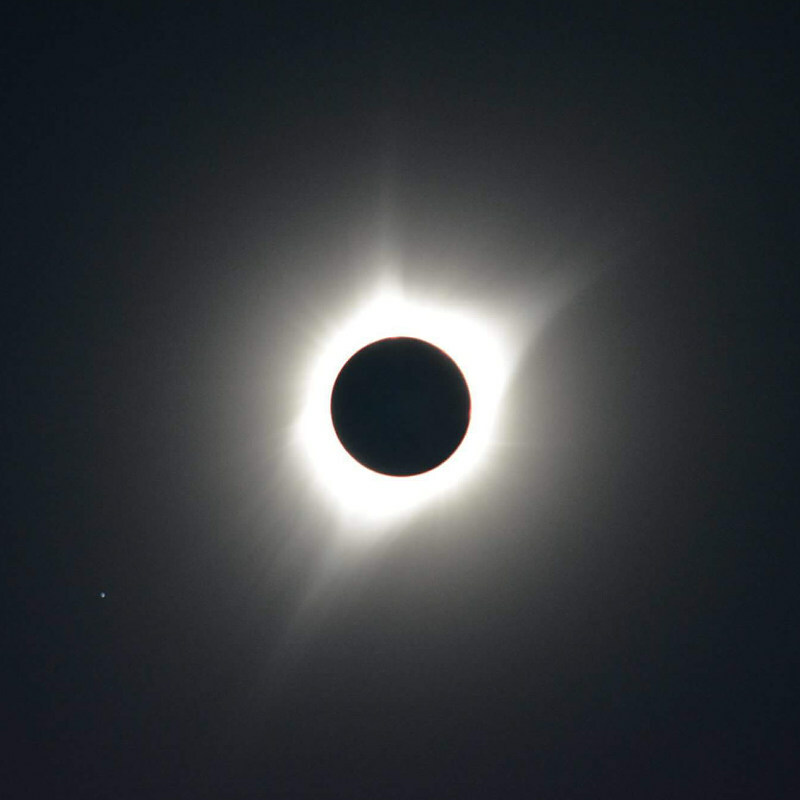 If you’d like to join us, please let us know so we can estimate how many people would be interested in a road trip and mini-vacation for the eclipse of 2024! See below for comments from some of our members who traveled to see this year’s event. We’ve got our first event in the West Valley going up very soon. We’re looking forward to seeing more follow so that we can better serve all of Phoenix. If you’d like to join in, please contact me and I’ll help you get set up to run HSGP events in the West Valley. Thank you to our wonderful volunteers in the West Valley! We cannot do it without you. It seems the news has evolved into a constant deluge of notable and important events. Before we’ve had time to reflect upon the impact and significance of one, a novel replacement pushes it away. Here is just a taste of the most recent highlights from August and part of September: there is a real threat of a nuclear missile attack from North Korea, Neo Nazis and other hate groups are marching in the streets of Charlottesville, Phoenix police gassing a protest without warning, there has been heartbreaking losses of life and property from the inundation of Houston and surrounding towns, and finally DACA (Deferred Action for Childhood Arrivals) has been given just six months to live. While I do not want to get into politics, there are some serious issues that we as Humanists need to be talking and thinking about. Our goal, by and large is to make the world a better place. My challenge to you is: how can this be accomplished? As Americans, we are instinctively drawn to the First Amendment. It’s the first, after all. But it’s also an invaluable weapon for combating tyranny. Is there a way to preserve the current notion of the right of free speech or is it somehow incomplete or too permissive? Or are these marches just something we need to live with regardless of how it terrorizes communities? How do we safeguard free speech to combat the harmful ideas or government policies of the future? How should responsible Humanists respond to the approaching thud of Neo Nazi boots in our streets? Make no mistake, they are here and will march in Phoenix. There are calls to remove the public symbols of the confederacy in Arizona. How will we respond to the inevitable Nazi marches in our own city? We need to be prepared for this before it happens. As I watch the news and the feeds of some of my Facebook friends and followers, I’m disturbed by a growing advocacy for violence. The calls to “punch a Nazi” seems harmless–even righteous–especially contrasted with the backdrop of the tragic murder of Heather Heyer. But this rhetoric is increasing. To some on “our sides”: Humanists, skeptics, agnostics, atheists, nones, this is not a just a slogan or a whim or a joke, but a creed. And, why not? Isn’t it right that we should strike back? It’s like that old saying: an eye for an eye, right? But a casual acceptance of violent vigilantism may lead to an escalation of violence and vigilantism. Is this a world in which we wish to live? Aren’t we trying to move past this and build a world that isn’t bound to holy book? Clearly, we cannot stand idle during these expressions of hate and terrorism and I applaud the overwhelming outpouring of support from the non-violent protesters in Charlottesville. However, I fear we may stand to lose ourselves through these struggles. Is this who we wish to become? I’m reminded of excerpts from the Humanist Manifesto III. “We are committed to treating each person as having inherent worth and dignity, and to making informed choices in a context of freedom consonant with responsibility…Humanists are concerned for the well being of all, are committed to diversity, and respect those of differing yet humane views.” What a fine line to walk. To defend the humanity of those who act inhumanely and would seek to destroy the lives of innocents and bystanders seems self-defeating. However, I disagree. I believe that this is an opportunity to shine. We must not become like those who hate and regard life so lowly that it makes it easy to classify others as inhuman. That’s not the world that we want or need. I don’t believe that’s what we as Humanists should–purposefully or inadvertently–be building. There are groups of people who need our help and solidarity. To name just a few groups: Muslims, African Americans, Jews, Latinos, and transgendered persons are all facing discrimination, but now it is overt and spilling into public demonstrations. I call upon those who are able to unite and show your support peacefully. You do not need to respect the Neo Nazi beliefs, but we should still treat the people with dignity. Let us come together to set the example and tone of solidarity, lest indiscretions become the banners of and recruitment material for domestic terrorism and white supremacists. Talk to your representatives. Attend City Council meetings. Tell them your thoughts on their actions or inactions. Be heard, but be respectful. If you don’t think that’s making a difference, run for an office or other elected position or volunteer to help with voting. Be an active part of orderly change, if you are able. Also, please consider making a donation to a responsible and reliable charity in the wake of Hurricane Harvey and the impending Hurricane Irma. There are thousands of displaced people in need of shelter and basic supplies. The situation in the flooded areas is to get much worse soon as the flooding has created a breeding ground for insects and water borne diseases. You do not have to donate to the Foundation Beyond Belief. Please feel free to donate to any charity you wish, but check them out on Charity Navigator, first followed by addition homework as necessary. What do you think? How else can we Humanists contribute? Is there a Sunday speaker topic or a speaker you’d like to hear take on these issues? Is there a panel discussion you’d like to see? Are there events you’d like us to host or promote? Let us know how we can do better or what you think Humanists should be doing. Nominations are now open for the election this November. Please suggest or volunteer for a position on the board of directors! Please fill out this form and follow the instructions contained within to submit your nominations. 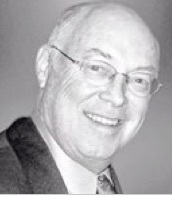 Allan Gittleman, who became a member of HSGP in January, 2003 and a life member in January of 2009, died on Saturday, June 24, in Scottsdale, AZ. He was 75 years old. An honor student and President of the Class at Cranston High School, he later attended Brown University, and Northeastern University where he earned a BS in Economics & Finance. His career in finance began in 1963 while in college and he served the financial industry for more than 50 years as a respected investment advisor. In 1988 he joined the investment firm of Janney Montgomery Scott (Janney) as Vice President in Providence Rhode Island where he pioneered the use of an investment strategy known as “secured option writing”. An avid collector of Americana, Allan was the author of the book “Scripophily”, a guide to the collection of antique stock and bond certificates. He loved music as a jazz enthusiast and provided scholarships to musicians through the entity “Jazz in the Hills”. Beyond these interests he played baseball, tennis, golf, and enjoyed skiing and sailing with his family. He loved to watch his wife ride thoroughbred horses. This workshop is held on the second Saturday of every month, except December. The next one will be held on Saturday, September 9. Here’s the link to my Meetup page, September Sleeping Mat Workshop. Any questions can be sent to my email address located beneath my name below. Please bring bags now, as our supply has shrunk a bit. Don’t know how to crochet? No problem. You actually don’t have to crochet; you can just make “plarn” (plastic yarn). However, I would like more people to crochet so we can get more mats completed. I or some of the “old-timers” will teach anyone who wants to learn. For those who want to crochet, you’ll need to bring a 10mm (size N) crochet hook. I also have some 10mm hooks available for $5.00. Come join us in this very worthy project. Make new friends, have fun socializing, bring snacks, learn a new craft. Optional request: The HSGP Community Center is owned by the members. Subsequently it takes money to run and maintain the center. It would be greatly appreciated if you could see your way to place a small donation in the jar on the card table by the entrance door. Prior to every meeting and event a volunteer request is emailed and/or posted on Meetup with a link to SignUp Genius where you can schedule your volunteer choice and time. If something comes up and you can’t commit to your volunteer choice, please let us know so we will know to compensate for the gap. We so appreciate your willingness to volunteer. This column is for the members. I’d like it to also be about and by the members by encouraging all of you to send me announcements of life events, questions about HSGP, contribute a piece for this column or suggestions of subjects you’d like to see posted here. Please contact me if you need any membership information or have a change of address, phone number, or email. Kathy can bring them to the September 10 meeting or she is willing to mail them. You’re standing in a field on a mountain top in Idaho, just after 11:28AM on Monday, August 21, 2017. The final orange Cheshire Cat smile is almost nearly straight as a thin, pursed lip. His smile which started cocked to the left ended fully turned on its side as if to whisper: “watch this and don’t blink!” The day takes on an eerie dimness, as though a large cloud had passed overhead on a cloudless day. The colors have evaporated. The air is grey as though you’re in a mist without mist and it is still. Nobody makes a sound. A shadow races toward you from the mountains to the west. The earth in all directions around you for 40 miles grows dark as night, but in the distance, the day burns like red fire from the land, fading to purple and a deep night sky. You tear off your eclipse glasses. When you look up, this is staring you in the face and with the size of a full moon. There are no filters, no photoshop. 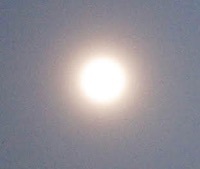 The sky is dark as night save but the wispy filaments of the corona. The stars and planets are visible just before lunch. This is totality. This is only a brief and indescribable moment that I have felt today. I was in the high Sierra Nevada mountains hiking with a Sierra Club outing during the eclipse. The eclipse was only a partial where we were. One of the other hikers captured pictures of the partial eclipse and I have attached one of them. Live in Des Moines Iowa, drove to Grand Island Neb.. I-80 was like the 202 freeway at rush hour all the way. All the rest stops were packed with cars and telescopes. Much cloudiness in Midwest, but we were ok at our location. DOT “road work” and an accident caused the return trip to run 7+ hours instead of the normal 3.5 hours. A great experience in spite of the traffic jams. Friends who went other ways, experienced considerable cloudiness. Expecting crowds of Biblical proportions, we set out at 5:30 am from Yahats, OR to the Yaquina Head Lighthouse in Newport OR. The temperature was frigid, the sky overcast and the ubiquitous OR beach fog was well represented. Highway #101N was deserted. We were the only car going north, barely 24 miles, to be sure we would be well positioned for the once in a lifetime event. We were lead to believe that traffic would be impossible, groceries scarce and parking at the lighthouse would be a challenge. Although we arrived at the National Park before they opened, we were probably only the 15th car in line at the gate. When the gates opened at 6:30am, were at a loss as to choose which parking spot to take, anticipating a difficult egress. We breakfasted on bagels, cream cheese, yogurt and fruit that our well prepared hosts had packed the night before. At about 8:30am, eager for the show to get under way, we decided that a better view of the sun would be had at the base of the lighthouse, about 1/4 mi ahead. Leaning into the blustery wind, we wound our way up the path to the lighthouse. There we decided that this would still not be the optimum location, so we started climbing up the steep mountain directly behind the lighthouse. We went about halfway up the switchbacks and only after I spoke up about having reached my limit of cold and endurance, did everyone agree that this perhaps is more than we are willing, or probably needed to do. We returned to the base of the lighthouse, where by now a crowd of perhaps 60 people had gathered.The cold, the wind, the dampness of the shifting fog prompted us to ask a ranger if there is a better place, perhaps one that is clear and sunny that we might go to? Well, yes. Just down the mountain. There the fog had lifted and sun was peeking through. Anyway, by now we were nearly back at the car. Well chilled, impatient, but excited for the show to begin, we were not going to give into the elements now! And then a hush fell over the crowd of nearly a hundred people. 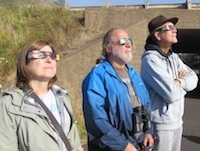 Donning our Amazon eclipse glasses, we were ready to be amazed! And indeed it was a grand show. The thick fog persisted, but somehow our glasses filtered out the fog and we had a wonderful view of the phenomenon. Halfway through the eclipse, Sandy [wearing his AZ shorts] couldn’t take the cold anymore and neither could I. We hurried back to the car and saw the last half of the eclipse from inside the car, engine running and heat on! Did we need to climb the mountain for a spectacular view? All we really needed to do was open the car door a bit and lean out for a totally unobstructed, perfect view. Hmm. Note two minutes of actual sunshine!